I had hoped to spend most of this weekend quilting but came down with the stomach flu on Friday night that my two daughters have been sick with. So I had a forced day of rest yesterday. 🙂 I seem to be feeling better this morning, thank goodness, but not 100%. I do have one finish to show you though and that is “A Sunny Day in the Garden”. This is my entry in the Canadian Quilter’s Association Trend Tex Challenge. Some years the fabrics are quite difficult for me to work with but fortunately this year I was able to think of something right away. I used my “Modern Grass” pattern for the background. This is a free pattern that you get when you subscribe to my newsletter. Sign up at the top of the sidebar! I used 1 1/2 ” strips to make a wall quilt instead of the 2 1/2″ strips that my pattern calls for for a larger quilt. So that used the blue and the green fabrics. I put fusible on the back of the birds and foliage fabric and fussy cut out of that fabric and then fused to my background. I stitched close to the edges for raw edge applique. Then I used the oragne for the border and the grey/blue, which has a frost type of print, for the binding. 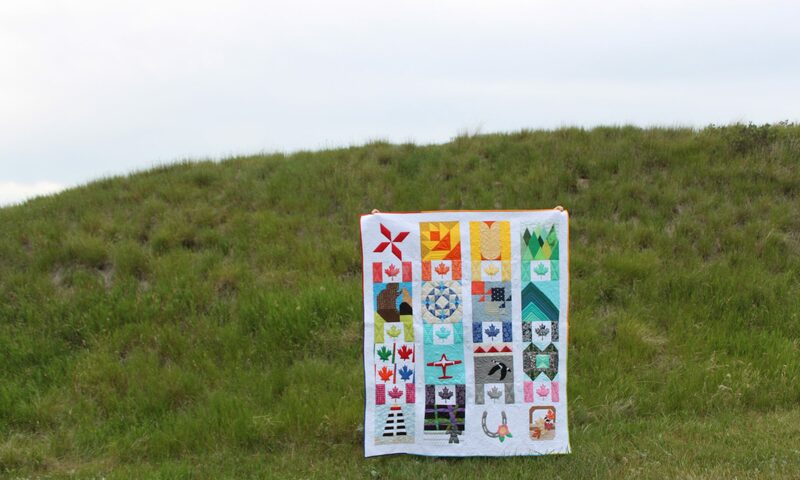 I quilted clouds in the blue, jagged grass in the green and loop-de-loops in the orange matching my thread to each. Very nice, Anita. Hope you are feeling better. I love quilts with birds, your is lovely!